Serta may be best known for their superior mattresses, but when that same knowledge and dedication to a good product is applied to office chairs, the result is premium product that is both stylish and affordable. While this chair is fairly large with many features, its weight is just 39 pounds. From this it can support people weighing up to 250 pounds. The seat of the Serta 43807 chair measures just short of 20 inches square, increasing by 5 inches with the inclusion of the armrests and a further four inches in depth when the backrest is included. The chair is offered only in a light grey, with hand-sculpted, upholstered armrests covered in the same bonded leather as the seat and backrest. At its maximum height, the top of the backrest is 43 inches off the ground, hitting 46.5 inches when fully extended. The armrests have the same amount of freedom, with a lowest height of 25.5 inches and a maximum height of 29 inches. Much like Serta’s other offerings, they have focused on comfort and health, but not neglected quality and style. 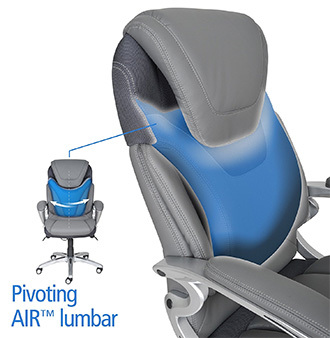 The first feature they offer is a unique pivoting lumbar support with Air technology. This specific lumbar module is able to move independently of the backrest, ensuring continuous support as you move about on the chair. The Air further makes use of a mesh material, interspersed in the leather to provide better breathability and air-flow. On the softer side of things, the cushions used are deep, ergonomically layered body pillows. In Serta’s own words, this offers the body a serene and tranquil seating experience. And who are we to argue. The chair was designed from the ground up to eliminate strain and prevent injury due to extended sitting. To make adjusting your chair that much easier, the levers used for this purpose are located far to the side, making them much better from an ergonomic standpoint. To make this work, the levers are short paddles, connected via cables to the actuating devices. Actuation takes the form of a pneumatic lift for height, as well a lockout for reclining, while also being able to adjust the ease with which the seat will tilt. The seat sits high on a five-pointed star configuration of large 60mm caster wheels. These offer smooth mobility from the fortified base layer which extends outwards for improved stability. Serta have a number of products on offer. The most noticeable focus that is present throughout their range is the continued presence of designs that are comfortable and aim to improve your health. 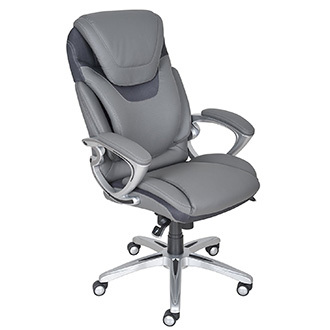 The Serta 43807 air health and wellness executive office chair is no different, offering a unique take on lumbar support with improved breathability. Often the visual design of the chairs can be overbearing, whereas the Air technology present in the 43807 is understated and modern. 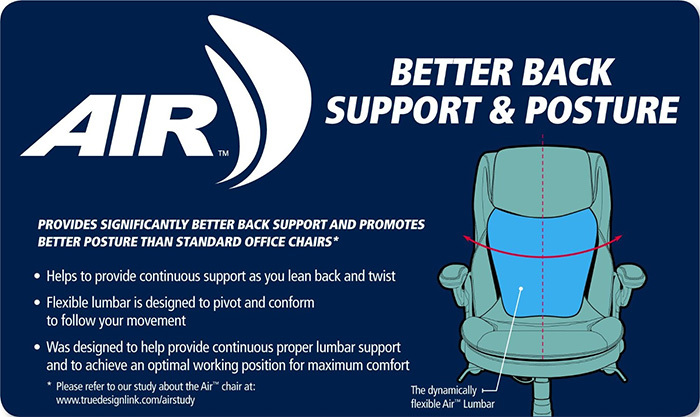 Serta offer this chair at a good price, and while making use of a fairly fixed frame design, the independent lumbar support ensures the product doesn’t under-deliver.